Growing up in Minnesota, Matt Spaeth was a long time target of the Golden Gophers coming out of high school. When Spaeth arrived on campus in 2003, he took advantage of his playing time and was named to the Rivals.com Freshman All-American Team. Spaeth went on to start the next three years for Minnesota at tight end. 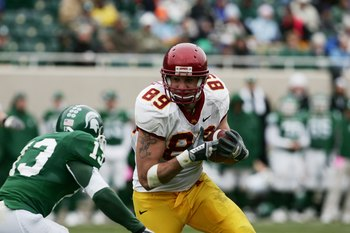 In 2005, Spaeth was named to the All-Big Ten First Team after a season where he caught 26 receptions and totaled more than 300 yards and four touchdowns. His senior season was his most productive year. Spaeth, who would later be a First-team All-American, attained a career high in both receptions (47) and receiving yards (564). Spaeth led his team to the Insight Bowl in 2006 and was then drafted by the Pittsburgh Steelers.